As the county town of Suffolk, Ipswich forms a major commercial hub and is well connected with major road links via A12 and A14 and a direct rail links to London, Norwich and the rest of country. 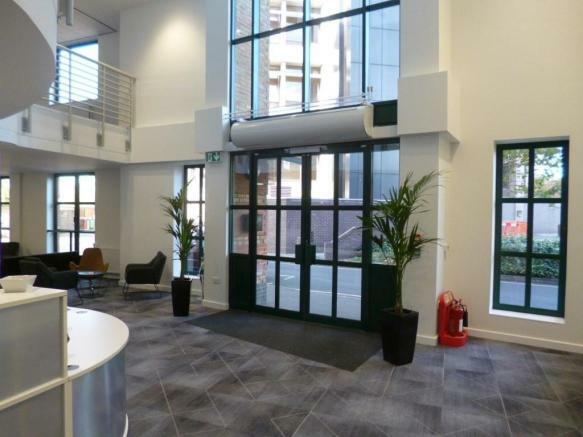 2 Friars Bridge Road is well positioned within the prime office district of the town and is within walking distance of both the town centre and railway station. The immediate area is occupied by other professional firms such as Willis Towers Watson, AXA and Birketts. The top floor suite enjoys views of several prominent Ipswich landmarks. The available accommodation comprises a fourth floor offices of approximately 409.15 sq m (4,404 sq ft). The layout offers a mixture of open plan and cellular office space with the flexibility to be reconfigured to the occupier needs. Access is via two lifts and an internal staircase with the ability for the tenant to create a reception area on the 4th floor, if required. Male and Female WC's are provided on the fourth floor. The accommodation benefits from suspended ceilings, air conditioning, central heating and raised floors. The remainder of the building is occupied by Concertus, who are a design and property consultancy. Two car parking spaces are provided with the accommodation with extensive public car parking available directly opposite the building. These particulars do not form part of an offer or contract. They are not comprehensive and are to be used as a guide only. They are not statements or representations of fact. All measurements are approximate. Interested parties should carry out their own inspection, surveys and enquiries to satisfy themselves fully in all respects. Concertus holds a long leasehold interest in the property and occupies the remainder of the floorplates. The accommodation is offered on a 5 year term with a proposed mutual break at the end of the 3rd year.Please contact the marketing agent for further details on terms and service charges. Electricity is sub-metered with water and heat to be apportioned on use. BT fibre and telephone lines are available for connection. VAT will be chargeable on the rent. Property reference 17-0189. The information displayed about this property comprises a property advertisement. Rightmove.co.uk makes no warranty as to the accuracy or completeness of the advertisement or any linked or associated information, and Rightmove has no control over the content. This property advertisement does not constitute property particulars. The information is provided and maintained by Concertus Design and Property Consultants Limited , Ipswich.